Dear Casey was put to sleep yesterday morning. I am going to republish a ‘Meet the dogs” essay that was written and first published February 25th, 2014. But before doing so, Jean and I would like to extend our very great thanks to all the staff at the Southern Oregon Vet Specialty Center (SOVC) who have been so professional and so loving and caring. Here is that essay. It is worth noting that we moved from Payson, AZ to Merlin, OR in 2012. Casey, at home; picture taken a month ago. Every Friday, the Payson Roundup newspaper would devote a full page to the Humane Society, displaying some of the cats and dogs they had for adoption. I would read about each animal and quietly wish I could bring them all home. I was particularly taken with one dog that had appeared several times in this Friday page. 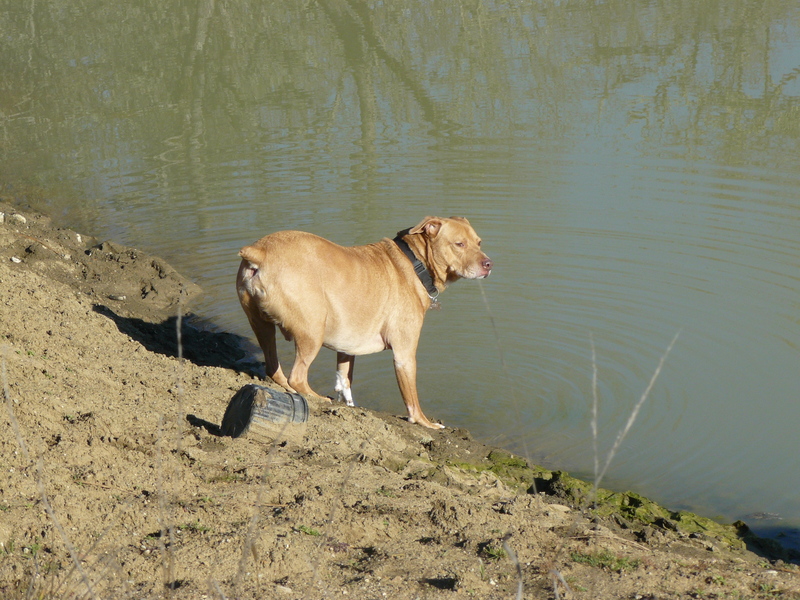 His name was Casey and he was a six-year-old Pit Bull mix. Unfortunately, at home we were ‘maxed out’ with a total of 14 dogs in three different sections of our house. We just couldn’t take Casey. I had volunteered to be a dog-walker at the Humane Society dog shelter. But after two sessions walking dogs, I just couldn’t look at these sad little faces without breaking down in tears. I switched my efforts to working at the Society’s Thrift Store. That was great fun and, at least, it felt as though I was still helping the animals. Nonetheless, I was very impressed with the animal shelter. They did their utmost to re-home the animals in their care. 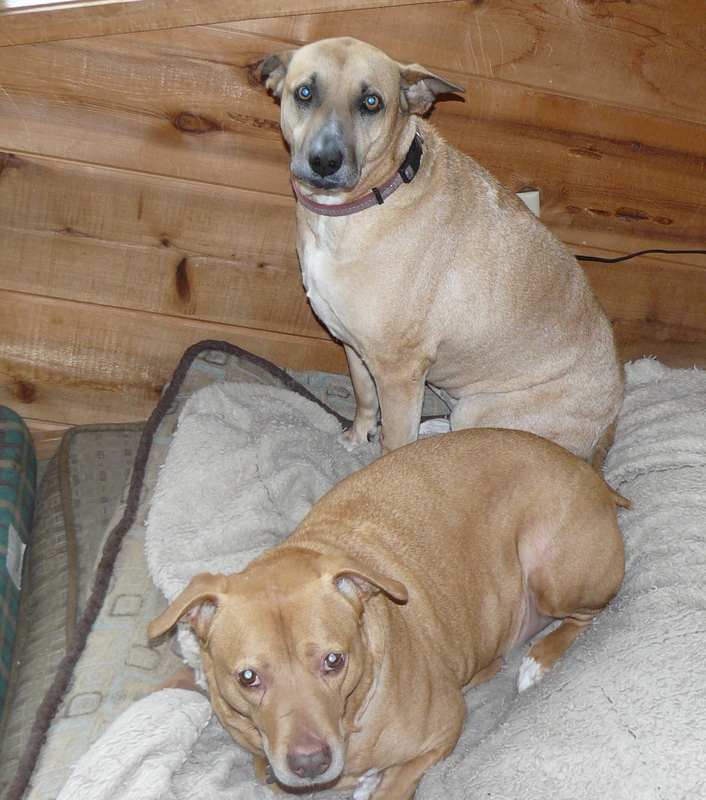 Ruby’s ‘pack’ here at home included Phoebe and Tess, rescue dogs from Mexico. 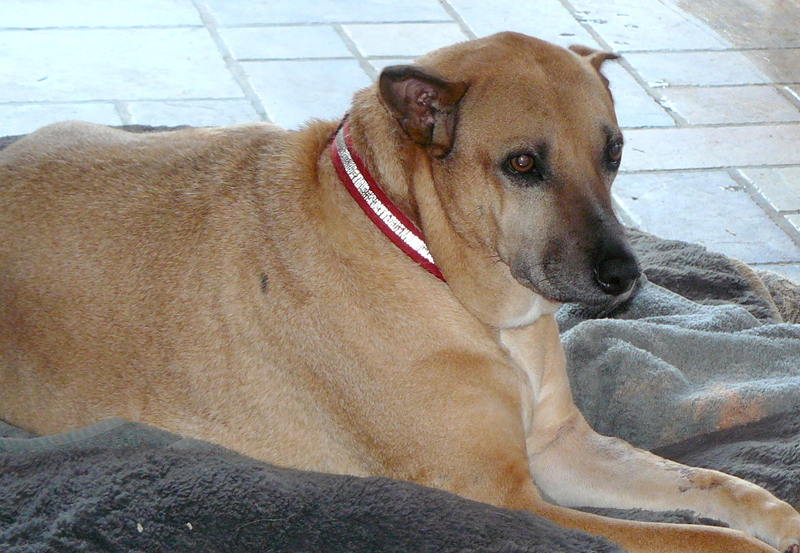 Recently, Phoebe had died with leukaemia and Tess with bone cancer leaving Ruby on her own. Ruby was a dog that didn’t mix at all well with the other dogs, as was explained in last week’s post. The next Friday, the Payson Roundup showed the Society’s ‘lonely hearts club’, highlighting animals that had been in care for a long time. The first dog shown was Casey. I telephone Chandra, the lady responsible for adoptions, and asked if Paul and I could bring Ruby to the shelter to find a companion for her. 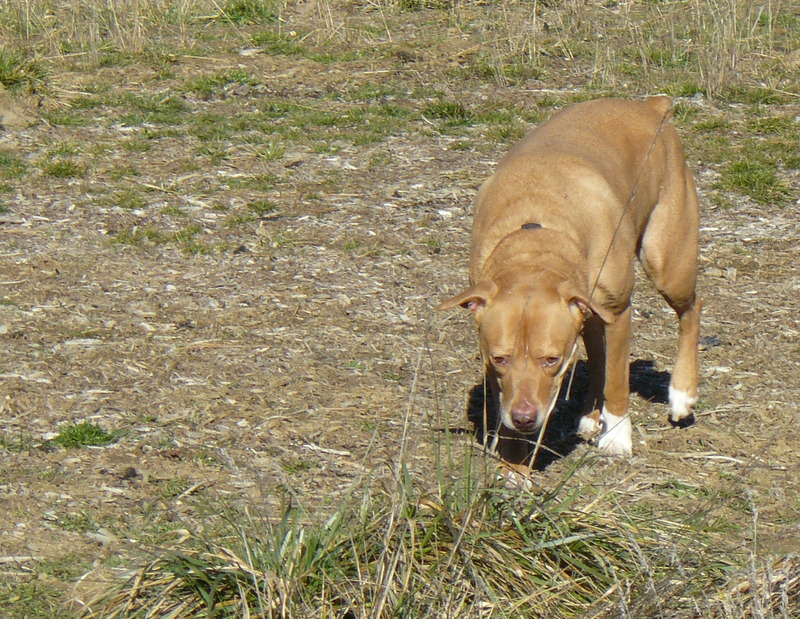 When we were at the shelter, Chandra asked us if we had anything against Pit Bulls. Of course we didn’t. Ruby was introduced to Casey and, as they say, the rest was history. Casey and Ruby right from the start were just wonderful together. Subsequently, I learned from Chandra that Casey had been in care for over a year and, had we not taken him home, his days were numbered at the shelter. There were many cheers and tears when I signed the adoption paper for Casey. Fast forward to the year 2012 to when we are now living at Merlin, OR. Casey now lives in the kitchen group here in Oregon: Paloma, Ruby, Lilly and Casey. As with all our dogs, Casey is so happy to have our 14 acres to play in. He is also the sweetest natures of dogs and will try to climb on to your lap at the first opportunity. I have always been a great advocate of Pit Bulls and Pit Bull mixes and have never come across a mean one. Thus, if you are in the position to adopt a dog, please consider Pit Bulls and Pit Bull mixes for the Pit Bull is a much-maligned breed. Casey demonstrating a dog’s focussing skills! This is how Casey will be remembered. Finally, recalling how close and good friends Ruby was with Casey, one couldn’t see a clearer expression on a dog’s face that Casey was being missed than on the face of Ruby. The picture was taken just before 6pm yesterday evening. Trust me, Ruby’s normal face truly has a smile on it. Paul – I am so sorry for your loss. I just wanted to let you know that you and Jean are in my thoughts. Dear Susan, that is very special. Thank you! I’m so sorry for your loss to both of you, Paul. You gave Casey a family, when this was more than needed and a very good dog life. And this is what we need constantly to remind us of. Casey had eight very happy years with us. Thank you so much! I am so sorry, Paul. Katrina, your kind thought means so much. Thank you! I’m so sorry, my friend. Sending you both [and Ruby] my thoughts and hugs. I’m sure they now live in a wonder place, light and happy. Dear Marina, especially the dogs that have had such a terrible start to their lives. Ex-rescue dogs always show a magical, loving attitude to their new ‘parents’. It makes their loss even more painful. I’m very familiar with this, my friend. So very true. My thoughts with you, and love with Casey. Thank you for giving her a beautiful life. Sweet Asha, thank you so very much! I had a very strong feeling that it was going in this direction but was hoping for a better outcome for you. I’m sorry too, for your loss. They leave a hole in your heart. I have also know many Pits and Pit mixes. Full of love for everyone. My niece has adopted 2. I used to live east of Payson and went through there all the time to Pinetop. My son is back in Show Low. I prefer Oregon. 🙂 Being a new reader, I had no idea you had so many dogs. It’s good you have lots of acreage for them to run. I could not work in a shelter either. My heart would break too. That’s a lot of grief to endure. Dogs feel it too. They miss their family. I left in 2011. Never regretted it. The bond between dogs and us is precious beyond words. I’m so terribly, terribly sorry to hear this, Paul. But I agree with Asha above: you gave her a wonder-full life. She knew love and caring and, above all, security. Thanks John. Working hard to hang on to that fact. Best wishes to you! Big hugs to both of you dear friends. Thank you, Tony. I trust it was clear that the post published back in 2014 was written by Jeannie. Ergo, it was Jean that couldn’t look at those sad little faces. Just made a tiny change to the post to make clear that the Casey essay was from Jean. My prayers to all who had the gift of knowing Casey as his Love lives on through the fond memories. Indeed Casey’s love does live on, Lori. Thank you so much for your loving wishes and a very warm welcome to this place. And you remind me, Lori, I must get my finger out and repair the online purchase process, especially for those that want to purchase an eBook. You clearly sense the special place, both within and without, that writing takes us to. 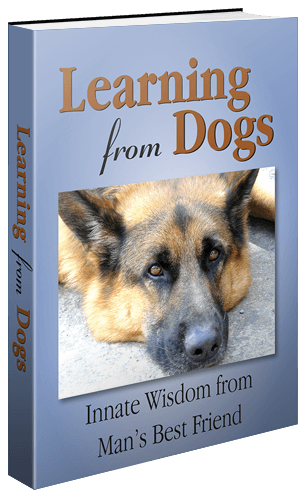 Yes, as Chert Dog comments in his book, “Doghead is pretty easy to learn, you just have to speak from your heart.” In honor of our beloved furry angels! Lori, as a relative newcomer to this place, you may not have seen my post of the 9th. February that contained a link to a BBC Horizon programme from many years back: The Secret Life of the Dog. I guarantee you will be blown away by what is revealed in that programme. Awesome, will check it out, and thank you, Paul! Still tearing from watching the clip, Paul! Isn’t “God” “Dog” spelled in reverse? So sorry for your loss. I hope the tender memories of your sweet pal provide some measure of comfort to the uprights as well as all the 4 legged members of your household. We hope so as well and fully expect that to happen! Thank you so much! True! But expressions of sympathy from you and many others do lessen the pain. You know that old adage about a problem that is shared is a problem that is halved (or something like that!). Thank you and you are most welcome to this place. So sorry to hear about Casey. It is so hard to lose a beloved dog. It happens that yesterday was the 11th anniversary of our loss of our black cocker spaniel Harry at 14 yrs, 1 month, exactly. We knew it was coming, he was old and had been diagnosed with hemangioma 6 months earlier. We adopted our golden puppy two months before he passed and I know he knew we had her to love and it was ok for him to leave us and his pain. Our golden Rosie is now 11-1/2 and healthy and happy, but as you know so well, they will always be loved and remembered. Thanks for sharing Casey with us all. I have been following and sharing your blog with friends for several years. Corinne, my apologies for being a little slow in ‘approving’ your comment. We have been trying to return to a normal life today. Anyway, a very warm welcome to this place doubled up with my sincerest thanks for following these scribblings for a while. Yes, our precious dogs will always be loved and remembered. I am so sorry that Casey was put down. You and Jean are in my thoughts. I know the day was vey difficult for both of you. Casey was a very handsome dog. I can empathize for I’ve had to put a number down in the past 4 years. They were all older pets with the exception of one. I don’t want to compound your grief but you didn’t write what the MRI showed. Or did I miss a post yesterday? The last update to the previous day’s post explained the findings. See here. Your kindness is beautiful; thank you! Again, I am so sorry of Casey’s demise. I re-read your post and I again, I just have to keep saying that I am sorry because I did not read your post all the way through. Why- I have no idea except I was in a hurry with many things to do. I’ve experienced diagnosis similar, cancer, and there is nothing that can be done except to let your pet go in order to free them of terrible pain and misery. That includes ourselves as well. When I had to let go of Muddy -the letting go was longer for me and for him but I knew the end result and that it would not be protracted. I had already been warned by the vet. None the less to lose a pet wrecks our hearts and we keep wishing that out beloved pet could live a few years longer. As my daughter has told me, you will lose your pet to cancer or renal failure and sometimes to a heart problem. But in the end we have one consolation and it is that we gave out pet a loving home and the best life that we could afford and physically deliver. And in the end that one consolation is enough. Enough for us lovers of dogs, and other animals, to carry on caring for them, adopting ex-rescues again and again, and knowing whether for a day or for a decade we made a beautiful difference to their lives. You wrote that perfectly. We who love dogs and cats and horses know that each time we rescue an animal, we will sooner or later have out hearts ripped and that we will grieve. I have met folks that refuse to get another pet so that they can spare themselves the trauma of loss. That doesn’t work for me. I love animals too much and I love them in my life even though a passel of pets is a great deal of work but I would not trade the work for anything else. Sending you love and comfort from Down Under on the loss of your beloved pal, companion and confidante. Marg, every expression of love and comfort means more than you can imagine. Big hugs! Your kindness in leaving your response is precious! Paul, every expression of sadness means so much to Jean and me. Thank you! I am so sincerely sorry for your loss. Welcome to this place albeit a very sad post in which to make your acquaintance! Yes, it is difficult, and it doesn’t get any easier over time. Yet incredibly more difficult if it were not softened by the comforting messages from you and so many others. Wow, what a beautiful and heartwarming post. It really lets you meet Casey. On how you met and eventually, how it worked out for you to bring Casey home. Beautiful stories like this keep your lost furry family members alive. Not only in your hearts. …but also in the hearts who read this touching post\story. It really felt like I was able to meet your dog Casey. My heart goes out to you on such a painful loss. Thank you for sharing. And your heartfelt feelings truly reach out to Jeannie and me. Thank you so much!